Mahalo to those who helped to support our Community Coalition Kauai candidate forums during the 2018 election. Along with a vast array of community organization partners and co-sponsors, we successfully hosted six County Council candidate forums! Mahalo! A new Kauai County Council will be sworn into office on Dec. 3, 2018. This legislative session, CCK will form a "council watch" effort alerting the public to agenda items (or lack thereof) that deserve a spotlight. Strengthening the community voice to hold County government accountable to people over profits in times of big money influence. Your donations can assist with paid advertisements in local media and Facebook boosts, as well as any events we may plan to hold. Our first ads are being published in The Garden Island Newspaper on Sunday, November 25 and Wednesday, November 28. Headline: Should Big Business Be Running the Kauai County Council? It brings awareness to the potential conflict of interest to have a Project Manager for Grove Farm in the important position of the County Council Chair. Grove Farm is a land development company, marketing commercial, residential, and agricultural lands. It controls one-fourth of the island, with its ubiquitous reach extending to every issue on Kauai from the water we drink to where we live and shop. 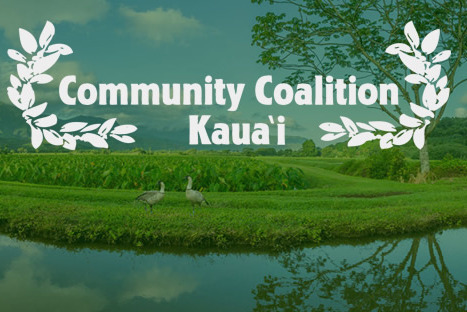 Community Coalition Kauai (CCK), with support from the public, distinguishes itself this past year as a group of citizens willing to roll up their sleeves and get to work, volunteering hundreds of hours on the County's recently adopted General Plan Update. With your continued support, there is more for CCK to do to educate and motivate Kauai citizens to stand up and stop the railroading of Kauai by corporate influence.